We propose to publish, in Monthly Parts, an Illustrated History of Chicago,—that is, a history of the more important and striking evidences of the City’s improvement and enterprise. This work will consist of twenty-five part, each number will contain at least four tinted Lithographic Views of the Public Buildings, Churches, important thoroughfares, of the River and Harbor, of the Lake Park and Grand Central Depot, and other objects and points of interest. These Views, one hundred or more in number, will afford a comprehensive picture of this marvelous city. With the last number will be given a “General View of the City.” Each picture will be accompanied with a brief but comprehensive Letter Press description of the scene or the building illustrated. The Lithographs will be executed from Original Drawings, by the Chicago Lithographing Company, who have been employed by us expressly for this Work, and whose reputation as artists stands equal to that of any of the profession in this country. They will, in point of artistic execution, equal any publication of the kind ever made in the United States. A limited number only will be published, and subscriptions, and orders for the Work can be addressed to us at our establishment, where further information can be obtained. 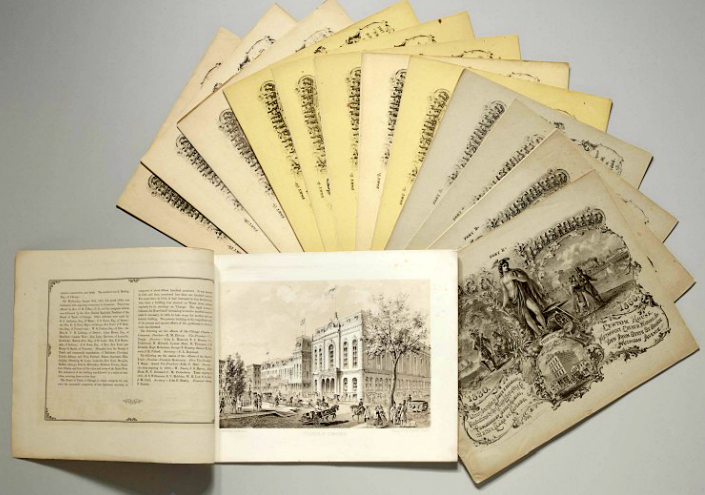 From later prospectuses we learn that the lithographs were made from original drawings by Leo Kurz (1834-1921), of the Chicago Lithographing Company, and that the subscription price of each issue was $1.50. For thirteen months, beginning with January, 1866, Chicago Illustrated came out as promised. Each issue contained within its highly ornamented paper covers four beautifully executed lithographs and eight pages of descriptive text. Then the series stopped probably because the publishers were losing more money than they could afford. Many more copies of Chicago Illustrated were printed than were sold. At some later date these extra copies were stripped of their paper covers and bound into single volumes, so that today, the publication exists in thirteen original parts and also a bound book. Jevne and Almini were interior decorators whose specialty was fresco painting. Otto Jevne was Norwegian by birth; Peter M. Almini was a native of Sweden. 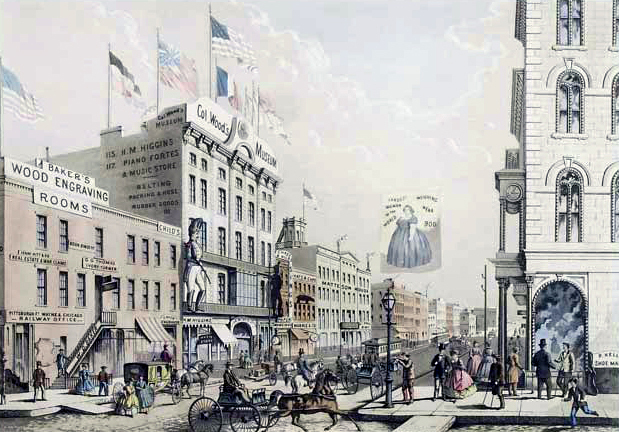 The former came to Chicago in 1853, the latter one year earlier. Both men had learned the fresco painter’s trade in their native countries, so their association in Chicago was a natural one. Examples of their skill were to be found in many of the city’s structures built between 1855, when their partnership was formed, and 1871, when the great Chicago fire burned them out. After the fire the partnership was not resumed, each man preferring to establish his own business. The artistic merit of Chicago Illustrated was due largely to the choice of a capable artist and lithographer. Louis Kurz was an American who made his way to Chicago in 1852. For eight years he worked as a “scenic artist,” and then turned to lithography. 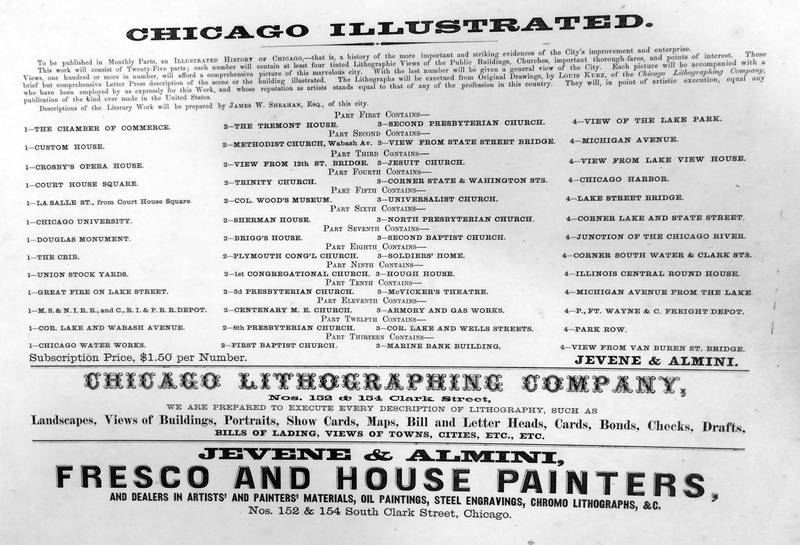 In 1863he joined with several others to form the Chicago Lithgraphing Company, which quickly made a name for itself. Like Jevne and Almini, the company came to an end in 1871. After the fire Kurz established the American Oleograph Company at Milwaukee. There he remained until 1878, when he moved the company to Chicago. Two years later he formed a partnership with Alexander Allison, and spent the last years of his life turning out hundreds of gorgeously garish chromolithography by which the firm of Kurz and Allison is known today. Although Chicago Illustrated lasted only half as long as its promoters intended, and came to compromise fifty-two plates instead of the one hundred or more that were originally promised, it stands as a remarkable achievement. 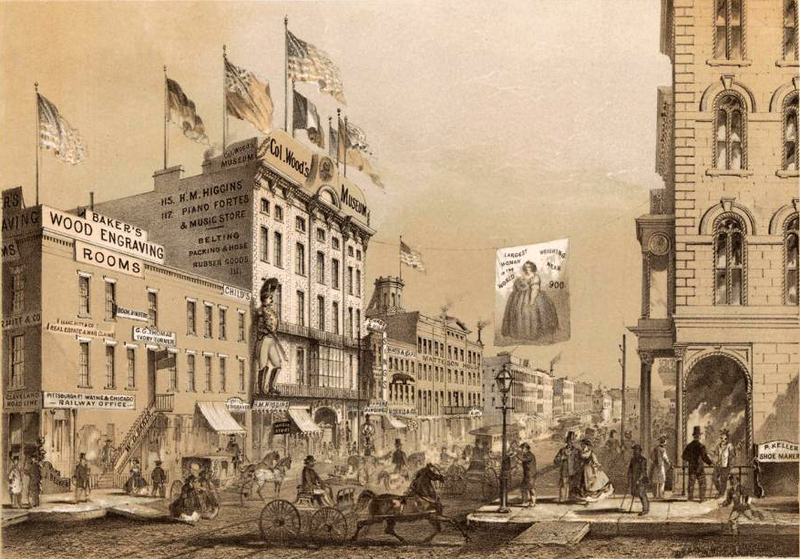 The lithographs, which measure approximately 8½ by 12 inches without margins, depict much of the city as it appeared immediately after the Civil War. Here are the principal buildings—the Post Office, the Court House, the Chamber of Commerce—the two great railroad stations, five of the hotels, a dozen or so churches, Crosby’s Opera House and McVicker’s Theater, the old Chicago University, the Douglas Monument, the Water Tower, and the Union Stock Yards. There are numerous street scenes, either by themselves or as settings for other pictures, and many people in the costumes of the time. The text hardly compares with the lithographs in interest, yet it has its merits. Sheahan, a veteran (Chicago Tribune) newspaperman, disdained any literary effect, and confined himself strictly to facts. Such an approach does not make for absorbing reading, but it is a godsend to the person who wants to know exactly where a particular building stood, when it was built, what it was made of, and how much it cost. It was written, drawn and published by Chicagoans and it is the best source for the physical appearance of the city the Great Fire destroyed. And it is rare enough to be worth a pretty penny, without being unobtainable. Raoul Varin’s engravings were published by A. Ackermann, Paris, France in the late 1920’s and were simply enlarged renderings, in aquatint, of the Jevne and Almini subjects. 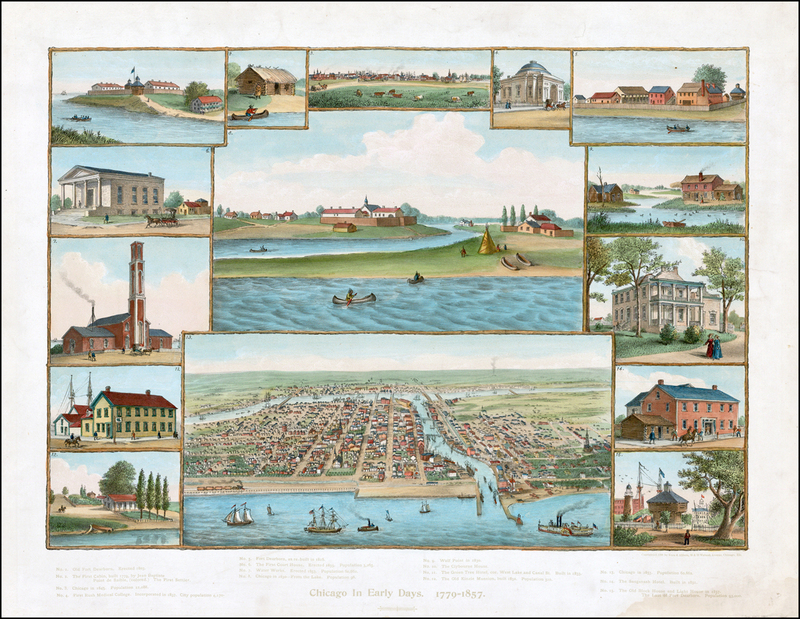 The Varin aqauaprints are delicately executed, beautifully colored views of Chicago. About thirty-one Varin prints were produced from the Kurz paintings. Pittsburgh, Ft Wayne & Chicago Ry Freight Dep. Some text pages bear logo for Church, Goodman & Donnelley Printers. A complete set of all 13 published issues of Chicago Illustrated. The last page of the thirteenth issue of Chicago Illustrated. This Gallery contains engraved views of Chicago. Views include the earliest settlements in the 1830s, the Chicago River, streets in the business district, government buildings, hotels, and other prominent sites. In 1865, Otto Jevne and Peter M. Almini joined with three lithographers, Louis Kurz, Otto Knirsch, and Edward Carqueville to form the Chicago Lithographing Co. Kurz drew and lithographed the prints for the ambitious Jevne and Almini portfolio, entitled Chicago Illustrated. The text was written by James W. Sheahan, a former Democratic newspaper publisher and journalist who worked for the Chicago Tribune. Sheahan also was the co-author of the 1871 book, History of the Great Conflagration-Chicago, Its Past, Present & Future.